For one of our three games this month, Ian wheeled out his 15mm Normandy collection to stage a small fictitious battle from a free scenario designed by Richard Clarke using IABSM. 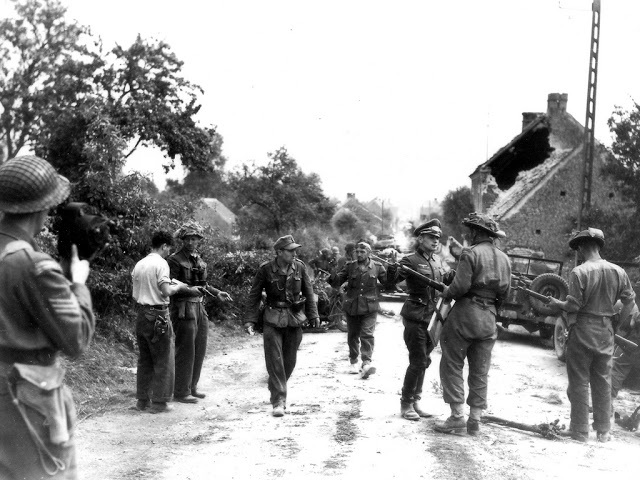 The scenario recreates what must have been one of many similar struggles going on in the closing days of the Normandy campaign in late summer of 1944 as the allies fought hard to close what became known to history as the 'Falaise Pocket'. The briefing and our table set up sets the scene and the map below is based on the one I quickly scribbled together noting the opening positions of the German troops and with the red arrows indicating the likely path of the oncoming Tommies. As the German commander of this scratch force the situation could only be described as a 'last man, last bullet' one with really the only objective to fight for as long as possible, causing as much damage and delay to the advancing British column before likely being overwhelmed. The one possible hope of seriously damaging the British advance lay in the 105mm battery in support of my position in a similarly parlous state having lost its transport in the retreat and now resigned to delivering as much of its remaining ammunition in our support. The picture below is seen from the eastern end (British) of the table with Blinds laid and the card deck arranged ready to start. As the British and German blinds became active, the usual pre-battle routine of spot the enemy began and Zug 2 together with the attached MMG under Obst.Fh. Christiansen got the drop on a British platoon advancing across fields to its front among a small group of houses at the front of the village. Deploying off their blind, not placed on table as they were occupying heavy cover, the MG42 let fly with a long burst supported with additional rapid rifle fire from Zug 2 shredding the lead British section and sending it reeling back into the middle of the field. As the staccato of rapid small arms and machine-gun fire erupted on the German left flank, the unmistakable clanking and labouring engine noises from tanks were soon heard before being seen by Zug 1 occupying a shattered French cottage on the right flank beside the road and the hastily marked out dummy minefield. Hopefully the appearance of mines across the road and the nearby ditches might hold the Tommies up long enough whilst they attempted to investigate it to allow the artillery observer to telephone back a fire mission. The British tanks were soon identified as the lighter American Stuart types and understandably in such close terrain they were advancing in a cautious manner with supporting infantry either side of the road. Unfortunately for Unst. Fh. Spielplatz and Zug 2 with their attention very much focused towards the road and the approaching tanks, they failed to observe the Tommy infantry moving in on their position on the extreme right through the hedgerows that allowed them to put in an immediate close assault that was beaten off but not without losing halve the men in the section. With the battle well and truly under way, the British platoon caught in the field before Zug 1 rapidly fanned out attempting to get into cover behind the thick banked hedgerows as the 'plop, plop' puffs of mortar smoke rounds dropped in front of the German position severely restricting the visibility. Meanwhile the centre British platoon coming abreast of their position opened up a lively fire on Christiansen's position and Zug 1 took early casualties, convincing their commander that now might be the time to pull back to another stop point, leaving the MMG team to cover the withdrawal. With an hour of battle already underway and British troops now clearly identified in front of the German position it became an immediate necessity to get some artillery support to reduce the pressure on the forward units and allow them to break off having caused initial casualties and now needing to relocate before becoming pinned and overwhelmed. The British commanders were doing their best to stop the Germans identified to their front from escaping and feeling more confident that they had a better understanding as to where the initial threat was positioned brought the tanks forward to bolster the fire from the infantry with their 37mm guns firing small HE rounds at neighbouring buildings. The first attempt to call in artillery fire failed as did the second and thus both Zug commanders were forced to fall back as best they could without the cover of the German artillery and with the HQ in the village keen to keep the second MMG in reserve and undetected until the British closed in on the village itself. In the end both German infantry Zugs managed to break contact and start to work their way back into the village as best they could but not without casualties and the MMG team covering Zug 2 were wiped out in a close assault as the British infantry under cover of their smoke cleared the forward buildings on the German left. With both forward German positions cleared and with the minefield identified as a dummy the British troops together with their tanks advanced within site of the centre of the village aligned along the lane leading to the group of houses recently cleared. As the British company commander assessed the situation and issued orders for the final assault to clear the small hamlet, the noise of battle was rent with the crashing and roar of high explosive as the German artillery battery finally joined in the fight. With the first marker round landing in the lane close to the British company HQ, the observer in the church spire called in 'fire for effect' and the British section closest to the fire lost six men and a nearby PIAT team was also killed, with the fire pinning the remaining troops. If that wasn't bad enough a stay behind German sniper located in the rear most buildings vacated by Zug 2 attempted to take out the British company commander, missing the senior officer but killing two soldiers from a neighbouring section and leaving them in shock. Then to add final insult to injury the remaining German MMG team opened up on the infantry supporting the British tanks coming up the hill shredding another section and drawing HE fire from the tanks in response shocking the crew. With two hours of battle completed the fight was entering the closing stages as the British reeling under artillery, sniper and MMG fire prepared to bring numbers to bear supported by their tanks with a section charging forward under fire to clear the MMG team after another softening up by the tanks. With the position under extreme pressure another barrage of artillery landed shredding the British platoon on the lane as the Panzerschreck team opened fire just as the British closed in on the nearby MMG team. The German anti-tank round was devastating when it hit the Stuart dead centre causing a massive explosion in the vehicle as the ammunition and fuel 'cooked off' causing the neighbouring tank to test for shock from the explosion which effectively pinned it for the next turn. However the explosion caused yet more casualties to the British infantry in and around the stricken tank. With the MMG team lost and the Panzerschreck team about to share their fate the last shots were heard down on the German left as the sniper opened fire, again killing two men and shocking the section concerned. Stmch. Fh. Fleischessen covering the extreem left flank and realising that no British tanks threatened his area ordered his men to ditch their antitank grenades and reverted to being riflemen opening up on the British section advancing through the orchards. The final mini-battle saw one of Fleischessen's men killed with two Tommies killed in return, which pretty much seemed to sum up the day with the British set fare to clear the village but having been made to pay a heavy price in dead and wounded. At the end of our game I couldn't help but think of the famous picture of Canadian Major David Curry VC, pictured at the close of a similarly seriously fought battle to clear the village of Saint Lambert-sur-Dives, blocking the final escape route of German troops out of the pocket. Perhaps a fitting tribute of a game to the men who fought the Normandy campaign on this the one hundredth anniversary of Armistice Day. Thanks to Ian for pulling our game together and to Dickie, and Andy for a fun afternoon.